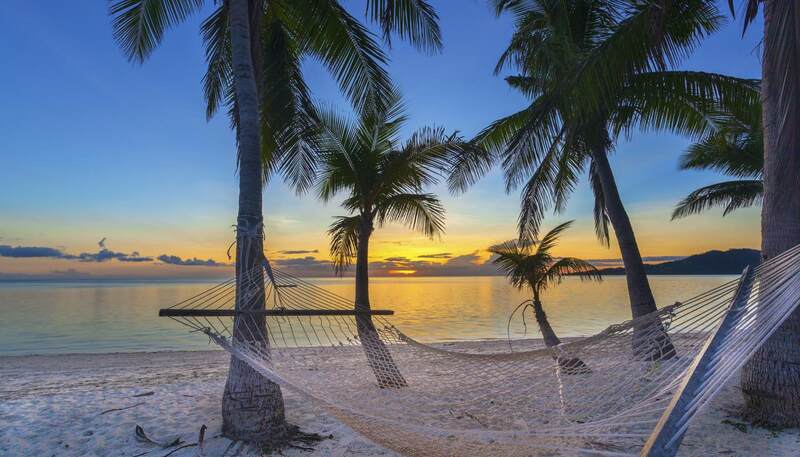 Fiji has a warm tropical climate perfect for beachside holidays. Maximum temperatures rarely move out of the 31°C (88°F) to 26°C (79°F) range all year round. Southeast trade winds from March to November bring dry weather and the rainy season runs from December to April. On average there are 15 cyclones per decade, and two to four actually cause severe damage. They occur from November to April and with greatest frequency in January and February. There is more risk in the outlying northwest island groups. Fiji does have a wet season, which is characterised by heavy, brief local showers and contributes most of the country’s annual rainfall. The wet season is normally from November to April and results from the southerly movements of the South Pacific Convergence Zone. Typically the smaller islands in Fiji receive less rainfall than the main Island with various amounts according to their location and size. Cyclones do occur in Fiji and are normally confined to wet season. The best months for holidaying in regards to Fiji weather is late March through to early December. Lightweight for summer, rainwear for the wet season. Fiji is located in the South Pacific, 3,000km (1,875 miles) east of Australia and approximately 1,930km (1,200 miles) south of the equator. It comprises 322 islands, 105 of which are inhabited (some are little more than rugged limestone islets or tiny coral cays). The three largest are Viti Levu (Great Fiji), Vanua Levu (Great Land of the People), both of which are extinct volcanoes rising abruptly from the sea, and Taveuni. There are thousands of streams and small rivers in Fiji, the largest being the Rewa River on Viti Levu, which is navigable for 128km (80 miles). Mt Victoria, also on Viti Levu, is the country's highest peak, at 1,322m (4,430ft).